The LNG storage tanks and export loading jetty are ready for commissioning and cooldown. Image courtesy of Chevron Australia. 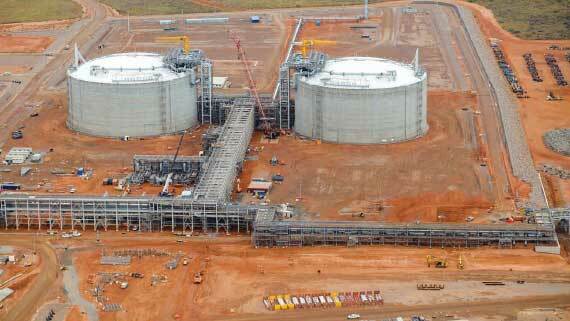 Owned by Chevron and designed by Bechtel, the Wheatstone LNG Project is part of Western Australia’s first natural gas hub and set to become one of the largest resource projects—providing greater security of supply in the Asia-Pacific region. To ensure safe operations the design included provisions for earthquakes and required seismic monitoring to assess plant condition after an earthquake and to determine Operating Basis Earthquake (OBE) limits exceedance to initiate emergency response procedures for a plant’s safe shutdown. The CONDOR System solution monitors free-field ground motions as well as the foundation and roof tank responses due to earthquakes and determines, in real-time, whether thishas or has not exceeded the plant’s Operating Basis Earthquake (OBE) design requirements to continue operations or initiate safe plant’s shutdown procedures. Provided solution designed to meet IECEx Explosion-Proof standards. Implemented CONDOR system solution to monitor seismic activity in real-time with automatic OBE analysis, alarm, and reporting. Learn more about our environmental monitoring software by downloading the CONDOR datasheet.